NOOSA Boathouse recently launched their new autumn menu inspired by the land and sea. The kitchen team is led by talented chef Shane Bailey, who has a strong paddock- to-plate philosophy. He sources direct from local farmers and fisherman ensuring his dishes represent taste, quality and sustainability. Some exciting new dishes on the Noosa Boathouse autumn menu include Brisbane Valley quail deboned, prosciutto wrapped, blueberries and pecans; beef bavette with Fraser Isle spanner crab and Thai green curry (Boathouse beef and reef); free range Chinese pork belly, local oyster mushrooms, pickled cucumber and rice; and the crowd favourite local snapper and Mooloolaba prawns served with Thai Penang curry, potato, green beans and peanuts. Monday-Friday: Two courses $30pp or three courses $37pp. Weekend: Two courses $37 or three courses $42pp. 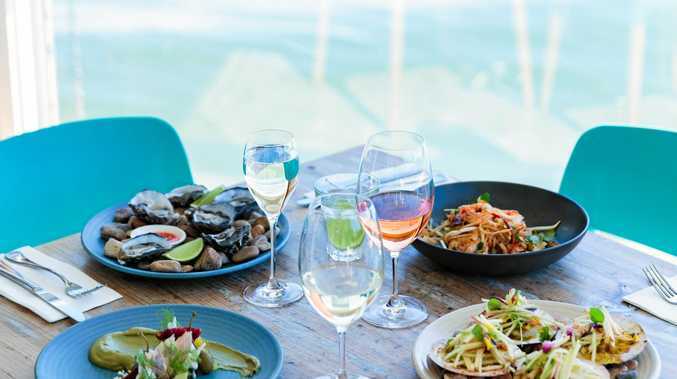 Noosa Boathouse is open as normal over the Easter long weekend and as many opt to eat fish or seafood, they will be offering four or five daily fresh fish, their famous three-tiered seafood tower and on Good Friday a four-course seafood feast $59pp. For those not interested in tradition, the regular menu is also still available everyday over Easter. Their top level, and appropriately named Sunset Bar is an amazing place to capture Noosa's best sunset views, a cocktail and snack from the bar menu. It's open daily from 4pm, but get in quick for a prime seat. The Fish and Chips Takeaway window on the front deck is open everyday from 11am (including all Easter public holidays) for those wanting a casual option or a picnic by the river. There will be busking on the Boathouse lawns during school holidays until April 22 from 4.30-7.30pm. If your party leg is tapping or they make you dance, throw them a few dollars to support them... otherwise it's free! Call 54405070 to make a reservation.